The UK’s climate Change Minister Greg Barker announced today that South West England will soon be home to the country’s first Marine Energy Park. The park, once completed, will stretch from Bristol to the Isles of Scilly and will have the potential to generate 27 gigawatts of power from the waves and tides of the area by 2050 – the same amount of power generated by 8 coal-fired plants. The project will draw on public and private resources with a huge boost from the world’s leading wave energy research and development facilities located along the future Marine Energy Park’s coastline. “Marine power has huge potential in the UK not just in contributing to a greener electricity supply and cutting emissions, but in supporting thousands of jobs in a sector worth a possible £15bn to the economy to 2050,” Climate Change Minister Greg Barker noted during the announcement. “The UK is already a world leader in wave and tidal power, so we should capitalise on this leadership to make marine power a real contender in the future energy market.” The park will use innovative technology to harness energy from the ocean’s tides and waves and feed it to the UK’s electrical grid. Today Barker launched the South West Marine Energy Park Prospectus, which will be the blueprint for moving forward on the development of marine energy in the area. The research and development facilities in the area make up the largest marine technology hub in the world – they include Cornwall’s Wave Hub, the Fab-Test nursery site at Falmouth, the new marine science building in Plymouth, and research facilities at Exeter University and the National Composites Centre at Bristol. With the help of government funding these research and development facilities will fuel marine energy innovation, and supporters are hoping this project will show the rest of the world the practical power of the ocean. Generators that gather energy from the ocean are able to serve as clean, dependable, and sustainable sources of power, although some environmentalists worry that these technologies are harmful to surrounding marine life. The installation of tidal turbines can be disruptive, and their moving parts can prove lethal to sea life. The UK has not released information on how it might seek to mitigate harm caused by the soon-to-be-installed technology. Care to elucidate how, Hyncharas, miles out to sea and 95% submerged, syphoning off a little of the very considerable tidal and wave energy that naturally causes massive erosion damage to the seabed and shoreline, this scheme counts as an eyesore, or something that erodes the natural world? Or would you prefer a lot more inland mining for lead, mercury and uranium contaminated coal to burn in the existing, far from pretty power stations? Or indeed the previously proposed and rejected (I think?) Severn Barrier that this is a higher-powered, more environmentally friendly alternative to? I like the marine power idea even less than those prop-wind turbines. Just what is my government's appauling obssession with power generating eysores or devices that erode the natural world?! The UK's climate Change Minister Greg Barker announced today that South West England will soon be home to the country's first Marine Energy Park. The park, once completed, will stretch from Bristol to the Isles of Scilly and will have the potential to generate 27 gigawatts of power from the waves and tides of the area by 2050 - the same amount of power generated by 8 coal-fired plants. 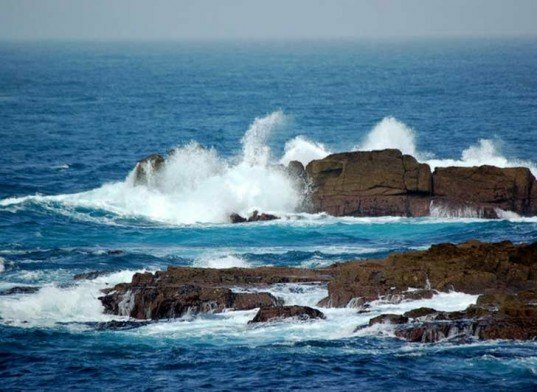 The project will draw on public and private resources with a huge boost from the world's leading wave energy research and development facilities located along the future Marine Energy Park's coastline.